I just wanted to thank you for one of the best times I have ever had. 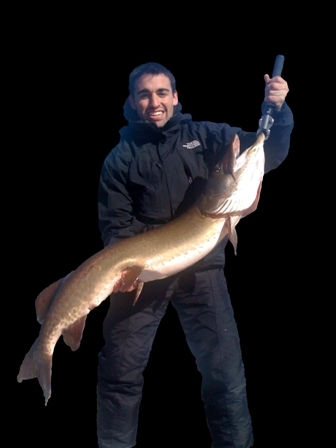 This all started because I wanted to cross catching a Musky off my “Bucket List.” I looked on-line for guides in northern WI and out of the three I contacted you seemed like the most down to earth. I was afraid of getting some stuffy old fisherman that had no sense of humor! Thankfully that was not an issue. Start to finish, it was truly one of the best days of my life. You took care of everything from picking me up and dropping me off at my hotel to providing the highest quality equipment I have ever fished with. You started the day by telling me that there were no guarantees in catching the very illusive Musky. On that note, you couldn’t have been more wrong!! You got me three nice Muskie before lunch so I asked if we could try Smallmouths and Walleye and we caught those all afternoon. I never once heard you say that you couldn’t or wouldn’t do something, anything I asked for you made happen. I can’t say enough about Musky Mastery and your expertise. I can tell you that you have gained a customer for life and I will recommend you to everyone I know. Chas Martin made our day of fishing one to remember. Conditions the morning we went out were not optimal, but I hoped to learn a lot about fishing for muskies that I could apply later. I was surprised when I had a strike inside of 10 minutes of fishing. Chas had clearly done a lot of work pre-fishing to figure out the best location on the lake, and kept us around active fish all morning. 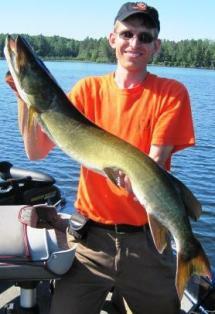 I should also mention that I caught a 40 inch muskie–my best fish in the last five years! Chas gave detailed instruction about presentation, lure choice, fish location and techniques. My knowledge of muskies increased more in a morning than in multiple years of trying to figure things out myself. Chas is an accomplished guide and teacher, and also really cared about us having a good time. Our family is looking forward to our next trip! I had so much fun musky fishing. I had never seen so many musky in one day. You were very helpful and nice. You knew every good spot. We got so much action with you. 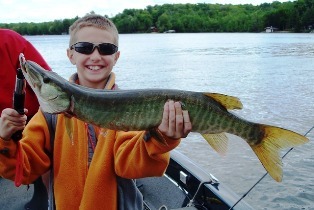 I caught my first musky, Connor, my little brother, hooked a musky, and my Grandpa caught a trophy 42-incher. It felt so good to get that musky in the boat. Taking pictures with it felt so good. All of my friends were so jealous. Everyone went “Whoa!” or “You caught that! ?” or “That’s a huge fish” You are the best guide ever and we are definitely going next year! We just wanted to thank you for a great fishing trip last Summer; the boys still talk about all of the Northern Pike they reeled in, as well as the bass, crappie, etc. It was an amazing day, and we sincerely appreciate all of the time and patience you had with our 9 year old twins, Calvin and Paul. 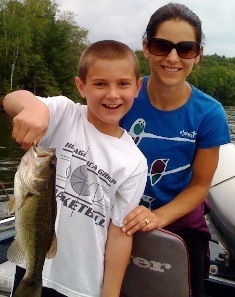 Your knowledge of the hot spots on the lake and ease with our whole family made it extra special. They have an “Up North” themed bedroom and the pictures holding their catch are front and center. They definitely have caught the fishing bug and I am grateful they love the outdoors as much as we do. We will be calling again next time we are in Eagle River. Through a search on the Internet I stumbled across Musky Mastery! I decided to book a day trip for myself and my dad as a Father’s Day gift. I thought it would be fun to hire a guide to help us catch some muskies. Not only did we catch a musky and have lots of action, we were taught so much in how to better catch the “fish of 10,000 casts”. Chas is a great guide, he is friendly, easy to get along with, and very knowledgeable of the waters he fishes. 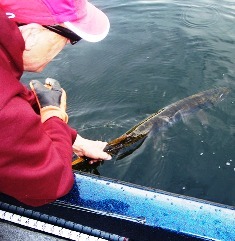 He gave us many tips and tricks to apply while fishing for muskies. Give Musky Mastery a try, and you will not be sorry. You will walk away at the end of the day smarter and more confident in the hunt for the “big one”. Musky Mastery Guide service is truly great! 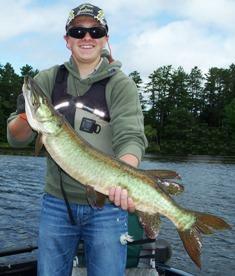 I went out as a first timer to musky fishing last summer and I was truly satisfied. First of all for the first half and hour or so Chas took the time to explain the basics of musky fishing like how to fish certain baits and how to do a correct figure 8 before we started fishing so I knew what I was doing. Then as we were fishing different spots he explained why they were good fishing spots and gave some great musky fishing tips. We were out there fishing for probably at least five hours and really fishing hard and were just about to call it a day when I was rewarded with a massive strike from a beautiful 34” musky I caught. It was the perfect way to wrap up the day, not only did I learn lots about musky fishing itself, but I caught a great musky, my first. Musky mastery guide service is by far the best guided fishing I have ever experienced. My experiences with Chas Martin are some of my favorite fishing days ever. Chas is one of the friendliest people I’ve met, and there was never a dull moment on the boat. Furthermore, our fishing success was incredible. 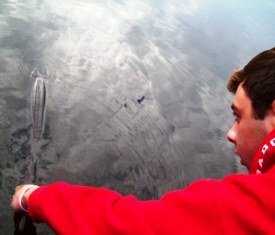 Catching my first muskie was one of the most exciting moments of my life, and I can’t wait till I’m out there again. Chas certainly knows his stuff when it comes to lakes, bait, and all other areas of fishing. He’s by far one of the best fishing guides in Northern Wisconsin. For my first time musky fishing, my friend and I went on a trip guided by Chas Martin. His services and tips were excellent and we caught a record 5 musky in one day! I caught a 50 inch musky and later won an award for it in the 2009 Vilas County Musky Marathon. The boat ride was smooth and Chas was well prepared with top of the line equipment. His knowledge of the waters we fished was impressive to say the least and he explained everything to a beginner in an easy to understand way. I would recommend this service to anyone who wants to have a great time and catch musky. I plan to go on many more trips with him in the future and I would recommend his guide service to everyone!